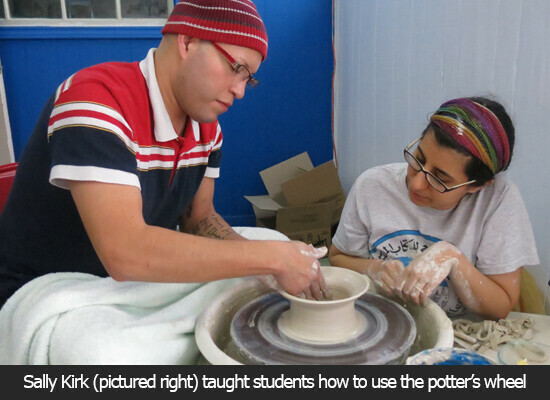 At a Lenten Pottery and Spirituality Workshop on Saturday, the Rev. 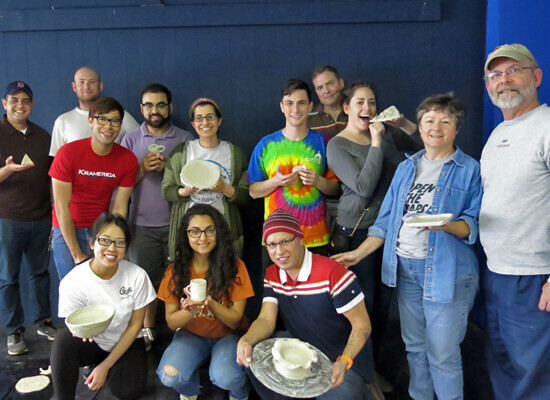 Eric Hungerford encouraged participants to be “co-creators with God.” The event at St. Mark’s Between the Bayous, Houston, was an opportunity for community members to learn pottery and engage on a deeper level of understanding of the creative process. Community member and potter, Sally Kirk, led the workshop. Kirk, a middle school orchestra teacher, has been working with pottery and sculpture for about three years. 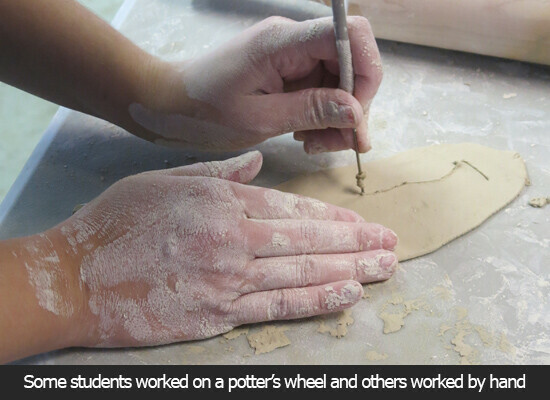 Her pottery studio is located across the street from the middle school, and often times she will leave work and immediately begin work on her pottery. 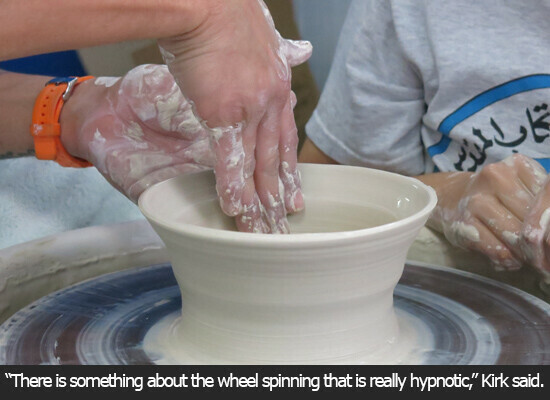 She says that working with the potter’s wheel is an especially spiritual process. During the workshop, participants were encouraged to strike the “gong,” a Tibetan singing bowl, for a moment of silence. Then, they could read one of several prayers about art or creation that were provided on slips of paper. Kirk joined St. Mark’s Between the Bayous community less than a year ago, but has already taken an active role. As a satellite campus of St. Mark’s in Bellaire, the church describes itself as a “sustainable, organic, and local Episcopal community” located just outside of downtown Houston between White Oak Bayou and Buffalo Bayou. Services are offered on Sunday and Tuesday nights. Sometimes the group meets in their church building, which doubles as a comedy club (Station Theater), and other times they meet at a local bar. At the center of the church’s mission is the idea that everyone is welcome and all perspectives respected. Art, music, and open discussion play particularly important roles in the community. Kirk’s husband, John, is an organist currently working for Holy Trinity, Dickinson, but before their marriage she had little experience with the Episcopal Church. As a native Houstonian of Egyptian heritage, Kirk spent much of her formative years in the youth group of the Arabic Church of Houston, a non-denominational Christian church serving a variety of immigrants from Middle Eastern countries and beyond. Kirk said she loved the emotional and artistic aspects of that church, but was drawn to the liturgical worship of the Episcopal Church. Still, she had trouble finding an Episcopal Church that met all of her needs. About 15 people attended the pottery workshop, but the demographic representation could not have been more diverse. Many of Kirk’s friends from the Arabic Church participated in addition to regular members of Between the Bayous. English, French, Spanish, and at least two different Arabic dialects were heard at some point during the event. 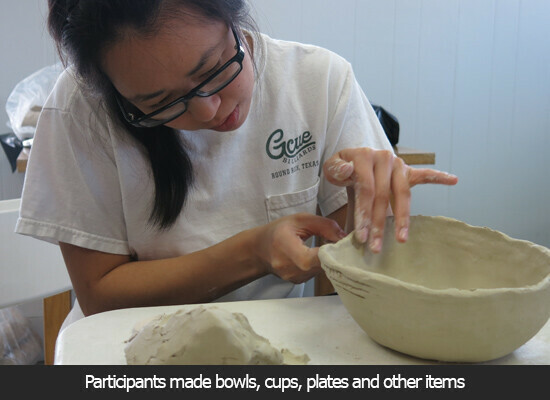 The novice artists created a variety of pieces including several cups and bowls in addition to more inventive items like sculptured pizza slices and a plate in the shape of a leaf. 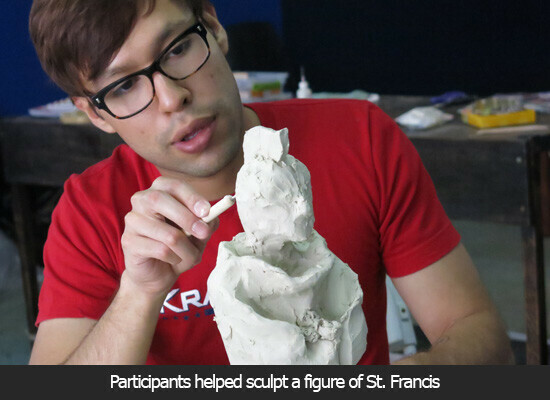 As part of a larger project, everyone was invited to help build a sculpture of St. Francis that would be placed in the church’s garden. In the true independent spirit of the community, St. Francis was given a thick Mohawk. Learn more about Between the Bayous here.